Mischievous Moles is the fourth level of the secret Cloud world from Donkey Kong Country Returns 3D. It represents the fourth world of the game, the Cave. At the beginning of the level, there is a plant on the left that releases a Puzzle Piece after pounding next to it. 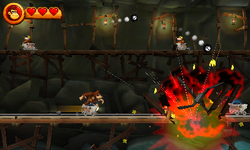 Right after the two falling crystals after the first checkpoint, the Kongs should pound a wooden platform to open the way to a Barrel Cannon, which leads to a Bonus Area. The Puzzle Piece will appear after collect all the items using the bouncy moving platform below them. After the Bonus Area, the Kongs should bounce on the Squeeklies to reach a high platform, where they must put out a lantern by blowing to reveal the Puzzle Piece. Near the falling crystals during the second minecart ride, the Kongs must make a small jump to collect the Puzzle Piece beneath some ceiling crystals. At the second ground area with the Mole Guards, there is a Puzzle Piece beneath a platform near some falling crystals. The Kongs must roll into it to collect it and quickly jump to safety at the last second. This page was last edited on April 13, 2019, at 01:00.